How airtight does your home need to be? That seems a simple question, but the answer is actually quite complicated. The Enhabit engineering team has long been advocating high levels of airtightness to help to achieve a comfortable building, whether or not a building is being certified to any particular standard. 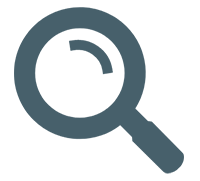 If gaps/holes in the building’s fabric are left unchecked, warm air can escape, and cold and potentially unhealthy air can enter into the building. The more holes, the more air escapes and the higher your heating bills. So, surely a completely airtight house is the best option? Well, yes, from an energy point of view, no holes is the best option. However, we tend to be quite good at polluting our indoor air (humidity, smells, CO2). In a traditional UK home, this is dealt with by a couple of extractor fans, opening windows and all those gaps/holes in the building. As you make a house more airtight, you can’t rely on these mechanisms and so need to design-in some proper ventilation. Part L of the 2013 UK Buildings Regulations requires an airtightness level (air permeability) of a maximum of 10m3hr.m2 @50pa pressure differential, but in reality this would be a pretty draughty building, and expensive to heat. SAP requirements normally force the building to be airtight to 4 or 5 m3hr.m2, as this maximises how energy efficient the building will be. The Passivhaus design standard goes further, requiring that the building is airtight to 0.6 air-changes per hour (ACH) @50Pa pressure differential. Although a slightly different measurement, Air Permeability and Air-Changes per Hour are normally quite closely related. As the airtightness requirement drops, the energy efficiency and comfort levels of the building will improve, but the difficulty in achieving very low levels of airtightness also increases. Most builders can achieve 4 or 5 ACH. 3 ACH needs a bit more thought and some specialist materials. Below 1 ACH needs a dedicated airtightness strategy from the start, specialist materials and a well trained site team. So how do I ensure proper ventilation? PassivHaus guidance is that we should provide 30 cubic metres of fresh air per person, per hour. That’s a lot of air and a couple of extractor fans aren’t going to manage it. Opening windows would achieve those sort of levels, but we tend not to want to open our windows in the winter as it lets the heat out. The best solution is therefore to introduce a Mechanical Ventilation and Heat Recovery (MVHR) system. This system extracts all the stale, humid and smelly air from bathrooms and kitchens and then uses the heat from this air to warm fresh air from the outside. Bingo – our nice airtight house now has all the fresh air we need, and we haven’t let any cold air creep in either. I’m not going for PassivHaus, what airtightness target should I go for? If, as with many of our projects there’s no requirement to certify, our advice is to set a target to reach the best level of airtightness you can get, depending on the extent of work, nature of building, timetable and budget (whilst ensuring that there’s a matching ventilation strategy). Remember, there are SAP points for improved airtightness as well. It’s a bit of a misconception that you can design to a specific airtightness target. It’s like saying that you’re aiming for a specific score in an exam – you’re actually always aiming for 100%, but you know that, most of the time, you’re not going to get there. 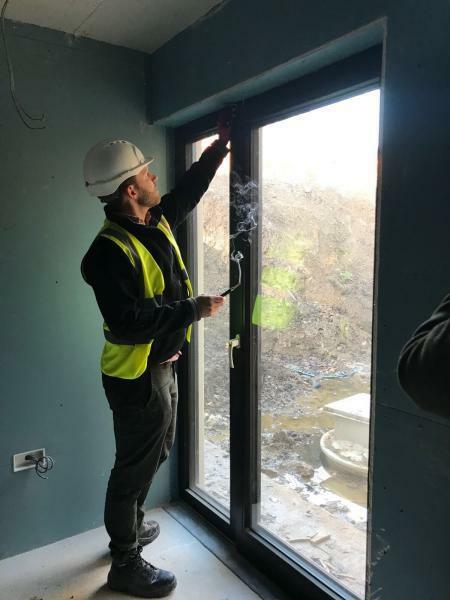 Hence, we always design for an airtightness of zero, and the result achieved is then determined by how far you want to go on site as well as how much care and attention the airtightness is afforded. Part of our detailed design workstream on our new build and retrofit projects involves creating an airtightness strategy and identifying an airtightness barrier which will achieve the target, usually drawn as a red line on the project drawings. This design comes with detailed advice on how to deal with the weaker spots in an airtightness barrier, such as wall, roof and floor junctions and around incoming electrical and plumbing services, along with the right materials to buy. Achieving the target is not easy, and it’s all in the execution. First the airtightness layer needs to be created. Then the windows and doors need to be installed without gaps where they meet the building, and the openings should be sealed when closed. Any service penetrations then also need to be made airtight. Whilst there are lots of airtightness products to help, it is the contractors who are to be congratulated when the desired target is achieved, and it should be recognised that there may be constraints onsite that may prevent that target from being met. It’s only when working on projects that didn’t quite hit the target that we get an understanding of how remarkable the achievements of those that hit the target are. You can see that the majority of the reasons for failure relate to design and training up front rather than the execution on site. 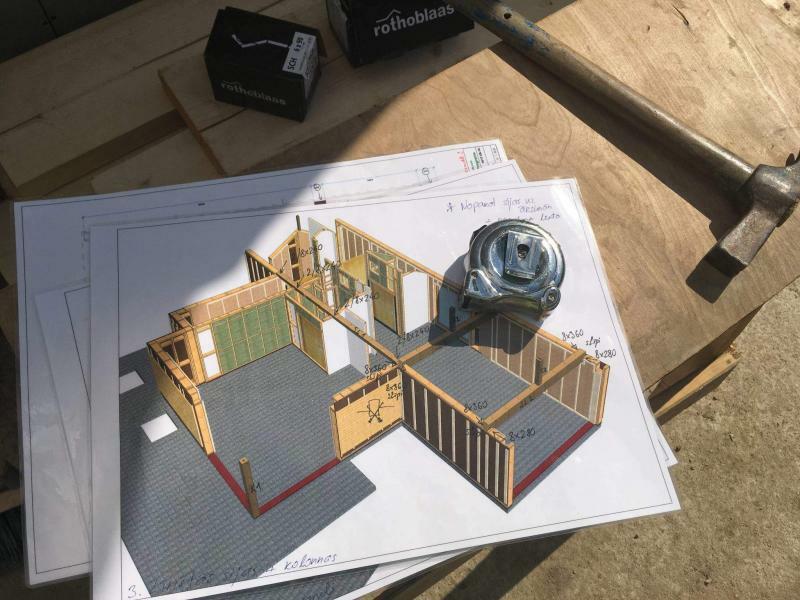 Typically, we find that with a bit of training, a builder will embrace the challenge of airtightness and take great pride in meeting the target. 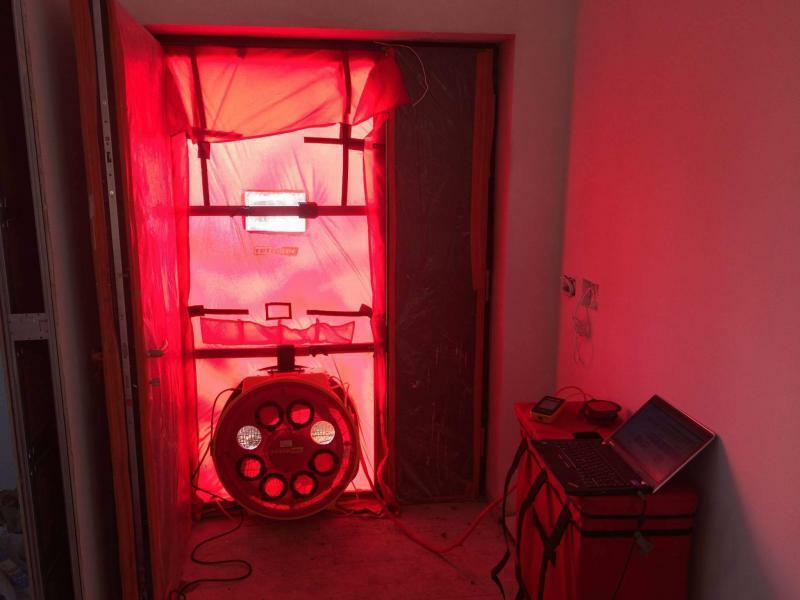 We provided airtightness testing services late on into two projects recently that didn’t quite hit their targets. This was because a properly designed airtightness boundary wasn’t considered right at the start of the project, and the on-site building team weren’t educated in what they needed to do. Enhabit wasn’t involved at the start but if we had been, these two points would have been dealt with right away. 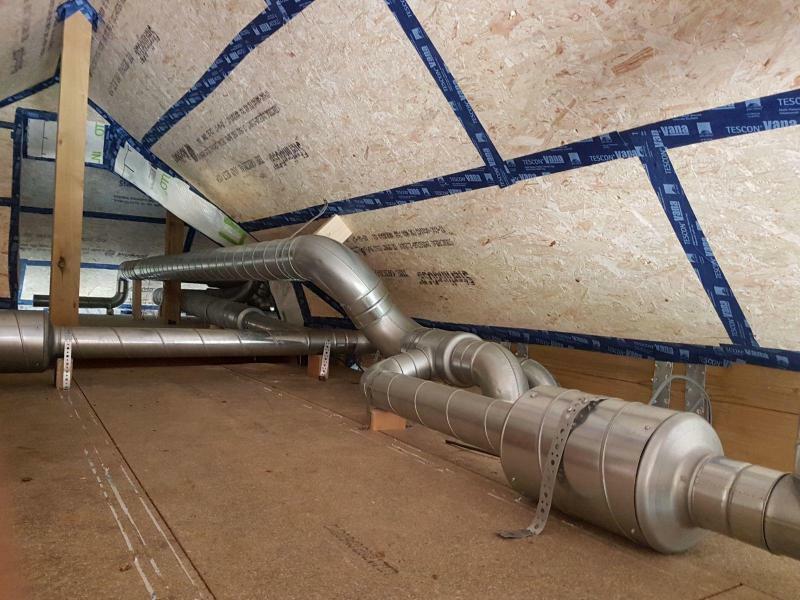 Enhabit’s clients for a recent newbuild timber frame project in Richmond weren’t looking to build a certified Passivhaus, but they were looking for high levels of airtightness and needed an MVHR to ensure healthy indoor air quality. When tested, the building achieved an airtightness level of 0.5 air-changes per hour @50pa on its first attempt. The project’s target was below 3 air-changes per hour @ 50pa, but the reason that the building far exceeded the target was primarily the high quality of the timber frame system supplied by Enhabit, plus the experience and work ethic of the assembly team who also took responsibility for installing the windows and doors. Reaching the desired target was included in the contract of supply, making it clear where responsibility for reaching the target lay. Using the timber-frame system removed the risk of failing to reach the requisite target and didn’t require much help from Enhabit, both in terms of design and onsite time. Whatever target level of airtightness is chosen for your project, meeting it requires careful thought and planning. It starts at the design stage with the building methodology/system. These early decisions can help to avoid cost and heartache during the construction process when mistakes are harder and more costly to rectify.